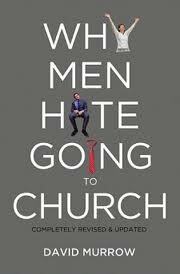 Why Men Hate Going To Church—the title says it all. It’s the question we have all had, on a subject we have all noticed, without ever asking. Perhaps you imagined that there was no answer. It is just one of the mysteries of life. Read this book by David Murrow and you will have answers that will make you wonder that you never noticed them before. He gives answers that stem from the fundamental differences of men and women. We see some of these ideas in marriage books to our advantage. I will confess to being skeptical as I began, but this book is compelling. As a pastor I found his marketing/media perspective unique and thought provoking. He shows that we have feminized church. Our services are much more favorable to women than men both in comfort and service. He gives a fascinating history of how this developed. As I read, I thought there is little than can be done about it, but in the last half of the book he gives practical advice. A new mindset is the key one. He is friendly to the contemporary style of worship and I am firmly of the old fashioned variety, yet where his type of worship fails men he minces no words. I appreciate that kind of candor. This work doesn’t pretend to be theological at all. If some idea he offers sounds like a marketing ploy to give them what they want with no regard to God’s glory, that is the reader’s problem. For what it is, this book could hardly be better.